“`Zsa Zsa Gabor was a legendary Hungarian actress and a Hollywood icon, who became a socialite along with her sister Eva. She began her stage career in Vienna, and was crowned Miss Hungary in 1936. She was married nine times, including to George Sanders and hotel magnate Conrad Hilton. 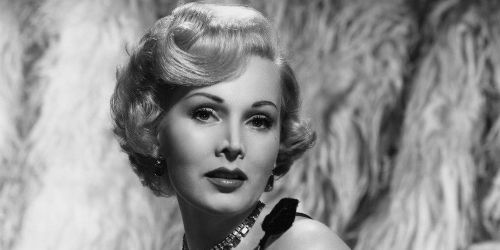 Zsa Zsa Gabor —> emigrated to the United States in 1941, and became a starlet with European style; a witty personality that epitomized exotic glamour… dah-ling. “`Described by director John Huston as a serviceable actor, she had roles in Moulin Rouge, Lili, Touch of Evil, Road to Hong Kong, and Pepe. On the small screen, Gabor flourished: A frequent guest on The Merv Griffin Show. She was also a panelist on What’s My Line? ; and guest-starred on The Red Skelton Show, The Life of Riley, Make Room for Daddy, Burke’s Law, Bonanza, Mr. Ed, F-Troop, My Three Sons, Rowan & Martin’s Laugh In, Gilligan’s Island, Batman, Night Gallery, The Fresh Prince of Bel-Air, The Love Boat, The Fact of Life, and Hart to Hart. In 1993, This is Your Life televised a tribute to Gabor. Zsa Zsa was humorously memorable as a spokesperson for AAMCO. “`Ms. Gabor occasionally appeared in theatre. From 1961 to 1970, Zsa Zsa portrayed Elvira in national tours of Blithe Spirit. She made her Broadway debut in Forty Carats. Over the next decade, Gabor nationally toured in Bell Book and Candle, Arsenic and Old Lace (with Eva), and Ninotchka. “`Zsa Zsa purchased a 8,878-square-foot Hollywood Regency-style home in Bel-Air that once belonged to Elvis Presley, and was originally built by Howard Hughes. She had a long-running feud with German actress Elke Sommer that began in 1984 when both were on Circus of the Stars, and it escalated into a multi-million dollar libel lawsuit by 1993. However, Zsa Zsa lost most of her total fortune in Bernie Madoff-related investments. Last year, her only child died. “`Zsa Zsa invented a new kind of fame, borne out of multiple marriages, conspicuous wealth, and a jaded wisdom about the glamorous life. The great-aunt of Paris Hilton, and the spiritual matriarch to the Kardashians, Simpsons, and other tabloid faves. Gabor was a hall-of-mirrors celebrity; famous for just being famous. “`The ubiquitous Zsa Zsa Gabor was 99. This entry was posted on Sunday, December 18th, 2016 at 4:31 pm	and is filed under Blog by Manny Pacheco. You can follow any comments to this post through the RSS 2.0 feed. Responses are currently closed, but you can trackback from your own site.